Kamen Rider Agito: Project G4 (G4 PROJECT 仮面 ライダーアギト Agito Kamen RaidāPurojekuto Ji FO?) 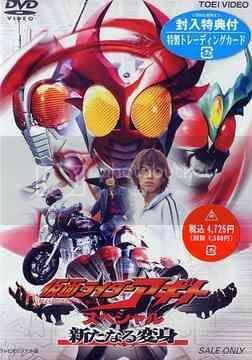 (English: Masked Rider Agito: Project G4) is a Japanese movie thatwas released by Toei in 2001. The film was played by Toshiki Kashu, Yusuke Tomoi, Jun Kaname, Rina Akiyama, Tokimasa Tanabe, Ryo Karato, and much more. Directedby Ryuta Tasaki. The film is a basis in Kamen Rider Agito and duration of the film is 70minutes. In addition to his film as a series Kamen Rider, Super Sentai movie HyakujuuSentai Gaoranger: Mountains of Fire, roaring was also released on the same date.